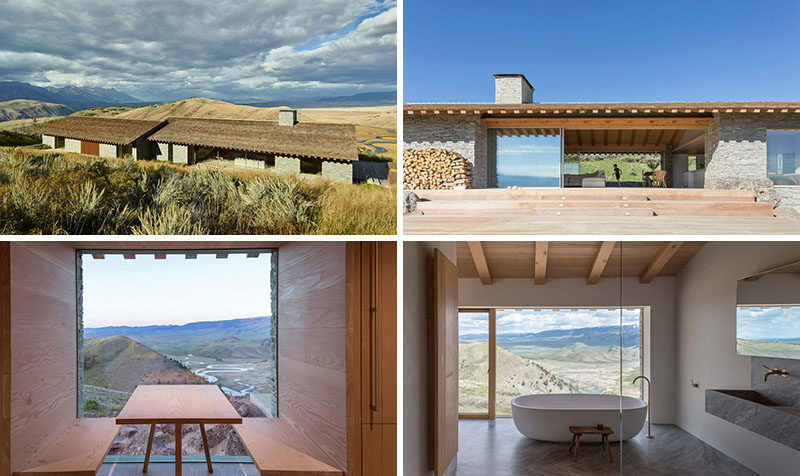 Architecture firm McLean Quinlan have designed this home that sits high above the town of Jackson, Wyoming, for their clients that fell in love with the location. 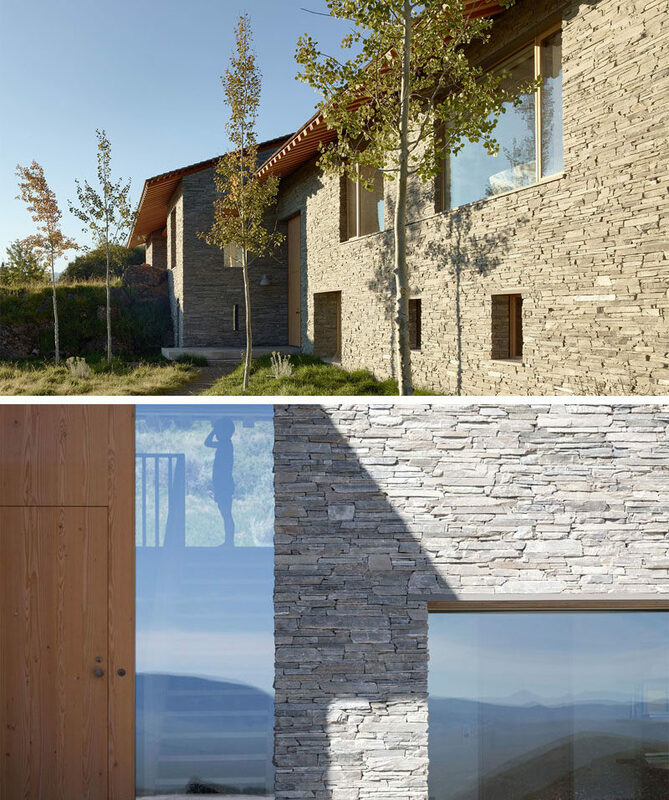 The design of the house, which uses materials like stone, wood, plaster and glass, is inspired by both European chalets and American cabins. 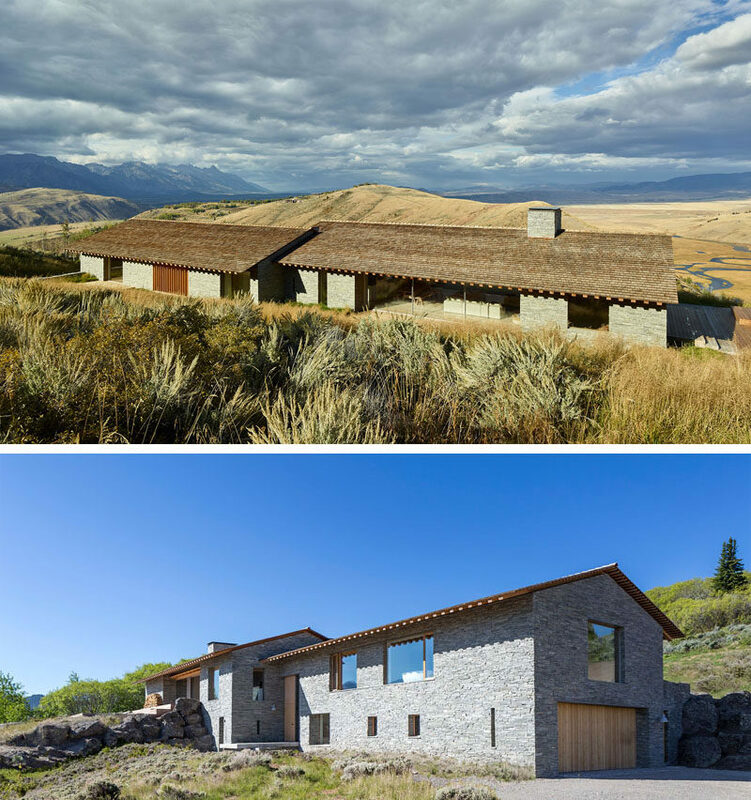 Over time, the silvered cedar shingle roof will blend in with the landscape, the stonework will cover with lichen, and the sagebrush will grow and creep up to the boundaries of the house. 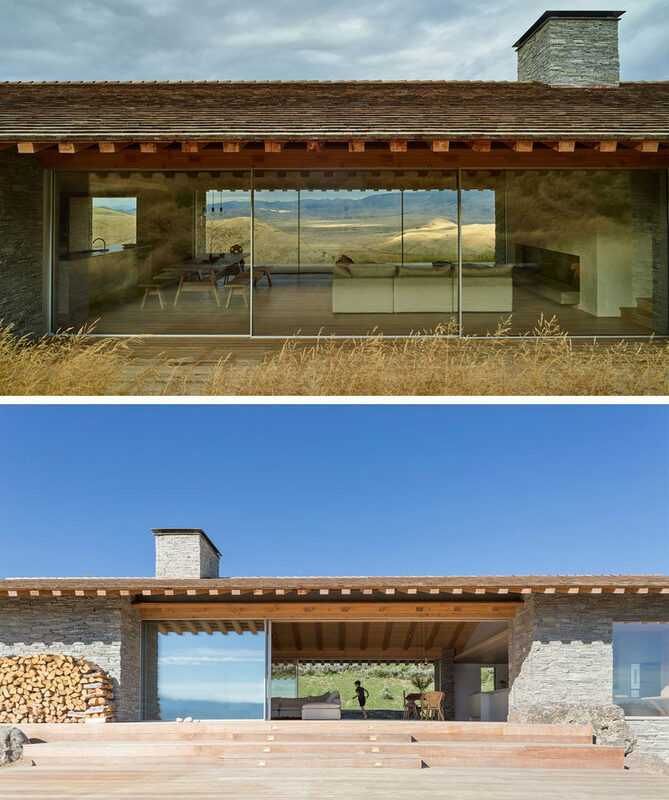 Large expanses of windows perfectly frame the view of the valley below and the mountains in the distance. 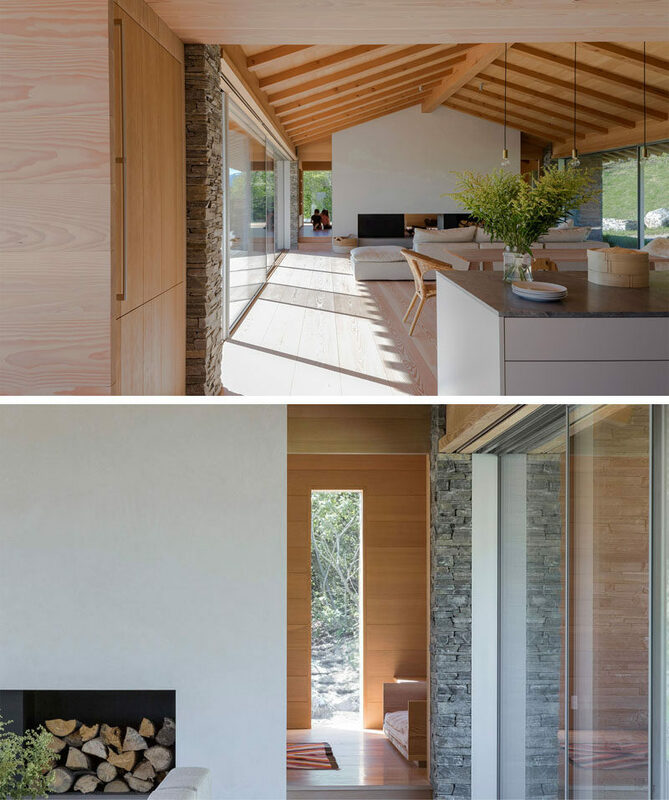 Inside, the gabled ceiling creates a sense of openness, and the simple neutral color palette makes the interior feel relaxed and inviting. 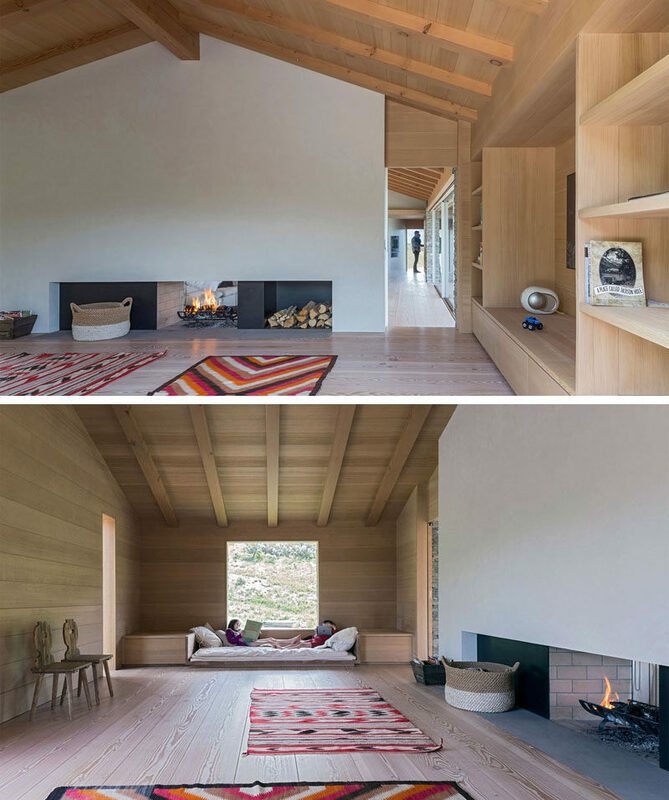 The kitchen, dining, and living room all share the main space, with the double-sided fireplace being the focal point in the living room. 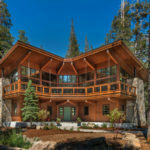 Beyond the fireplace is a secondary living space, with built-in book shelves and a built-in day bed under the window. 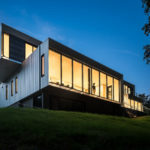 Just off this room is an outdoor deck with a spa. 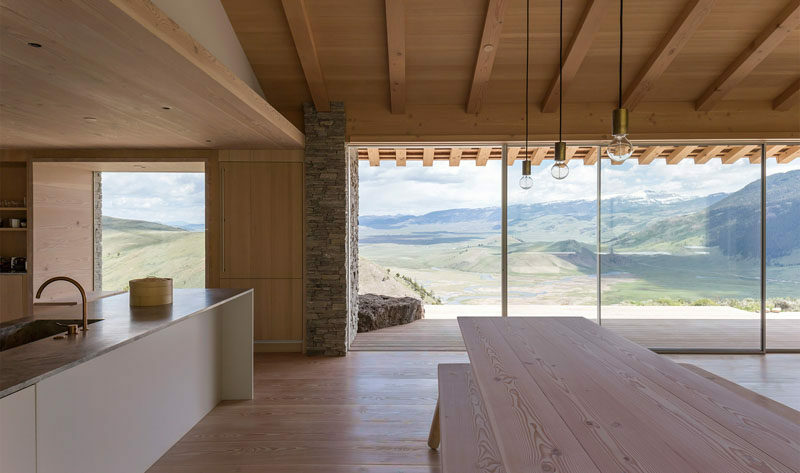 Back inside, here’s a glimpse of the view that the main living area is able to enjoy. 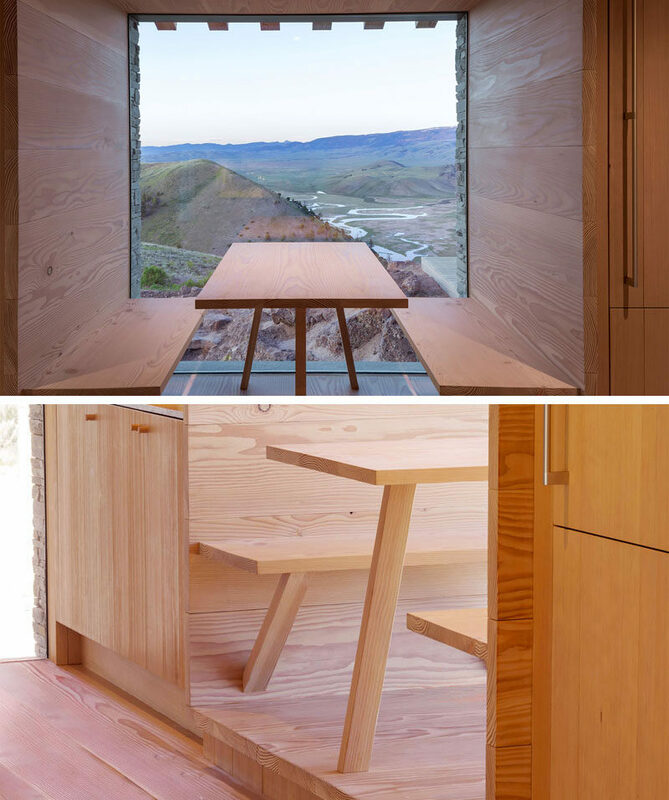 Just beside the kitchen, there’s a built-in dining nook with benches that has a perfectly framed, unobstructed view. 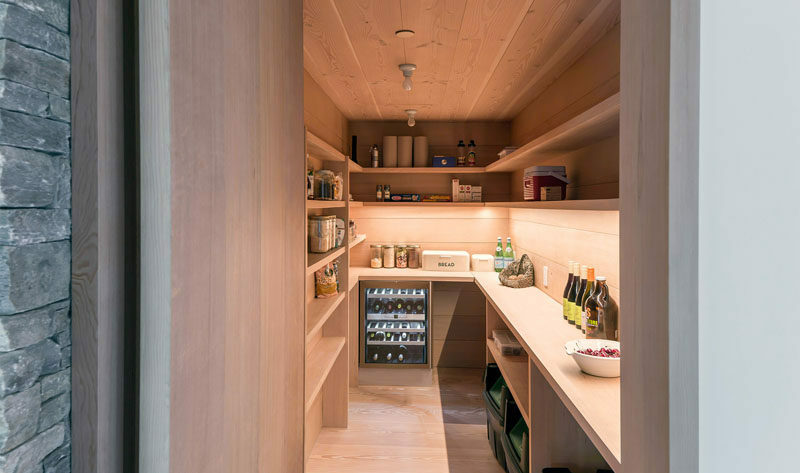 The home also has a large wood pantry with plenty of built-in shelves, counter space and a wine fridge. 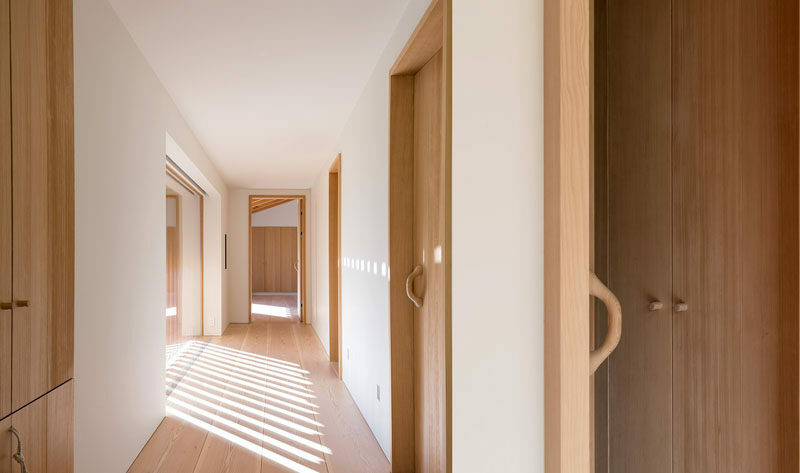 Here’s a look at the white plaster that covers the walls in this hallway, and when paired with light wood doors and flooring, creates a contemporary interior. 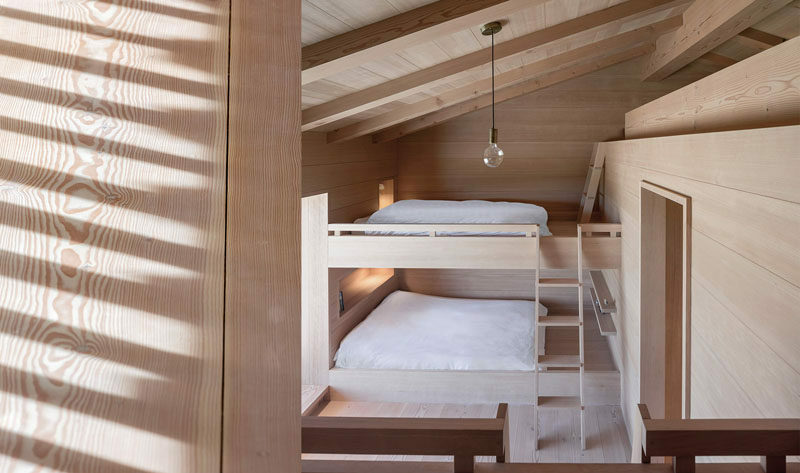 In one bedroom, there’s built-in bunk beds and a small loft area. 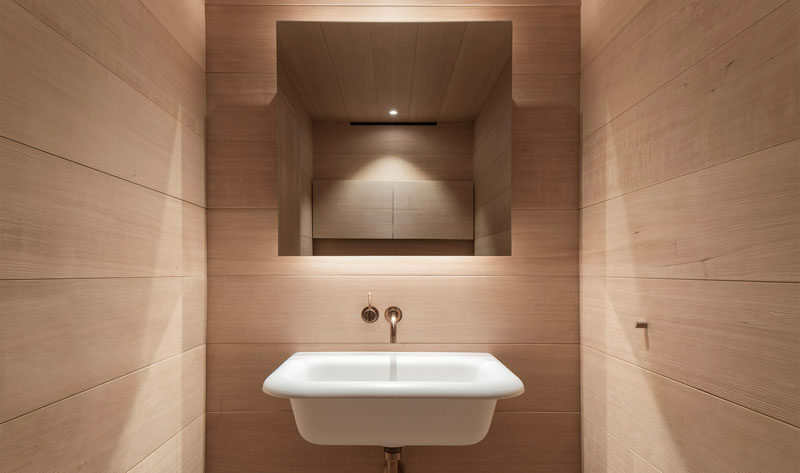 Here’s a look at the bathroom that has wood covered walls, a backlit mirror and a simple white sink. 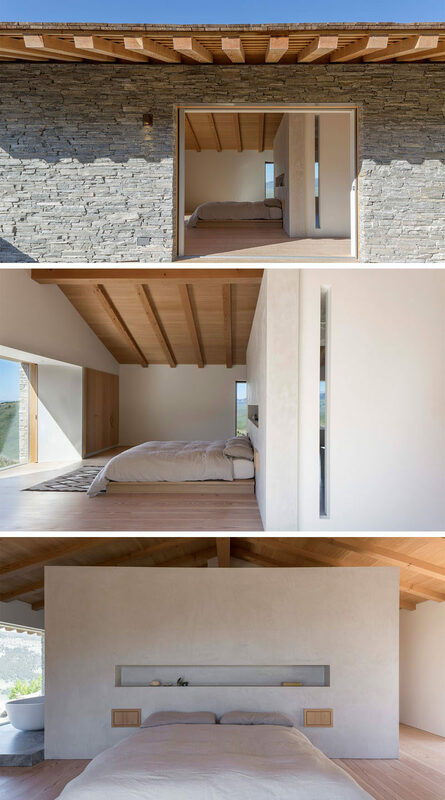 The large master bedroom has doors that open to the outside, while inside, a wall with a built-in shelf becomes the headboard for the bed, while a window opposite the bed is great for relaxing mornings. Behind the wall in the bedroom is the ensuite bathroom. 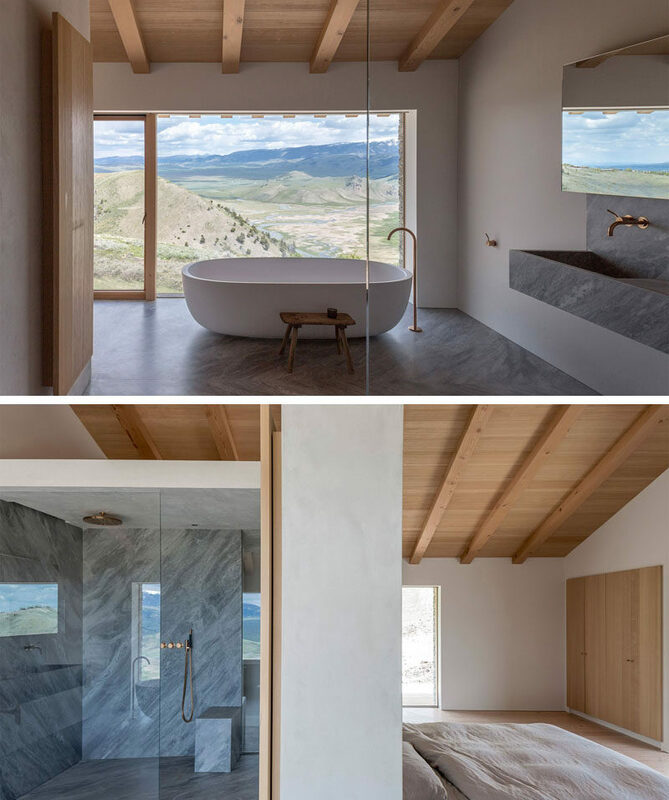 The white standalone bathtub has a huge picture window so you can relax and take in the view. There’s also a large walk-in shower that gives you plenty of room to get clean. 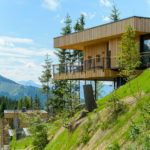 Architects: McLean Quinlan | Executive Architect: Berlin Architects | Structural Engineer: G&S Structural Engineers, M&E and CN Engineers | Landscape Design: Verdone Landscape Architects | Contractor: North Fork Builders Inc.